"Insulating & Ventilating Australian Homes Since 1977"
Austral Insulation is a premier supplier and installer of various types of insulation and roof insulation in Brisbane. Our company has been in business for over 36 years and is a trusted partner of many home and business owners for their insulation and ventilation needs. As specialists in thermal and acoustic insulation, we believe in providing quality, innovative solutions to make living environments comfortable, safe, and energy efficient. We provide a range of products to make your home a quieter and more comfortable retreat. Austral Insulation understands that every household is different and every family has unique needs. This is why we take an individualised approach to every project. With our range of products and services and a fully trained team of specialists, you can expect success in every installation project in your property. Contact us to get a quote for your home insulation in Brisbane. 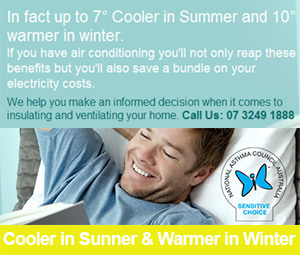 Keeping cool in summer and warm in winter is the key to home comfort. The Bradford range of thermal insulation products provide a cost effective way of helping to maintain a constant temperature in your home all year round. The Edmonds range of home ventilation products work hand-in-hand with insulation and draught control, to create a more comfortable and energy efficient home. Too much moisture or humidity in your home may lead to mould and rot, which can impact on your health and the structural integrity of your home. With Bradford products, it can be prevented. Speciality products for acoustic and thermal insulation to:- Pipework, High Temp. Vessels and air-conditioning ductwork.